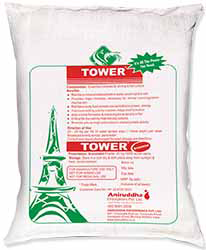 Tower - Aniruddha Enterprises Pvt. Ltd. The culture of Litopenaeus vannamei in inland low salinity waters is currently being practiced in various countries around the world. These environments are often deficient in key ions essential for normal physiological function, including potassium (K+) and magnesium (Mg2+). Deficiency of vital minerals can result in poor molting, weak carapace formation & weak osmoregulation. Tower* provides bioavailable forms of essential minerals & ions like Mg+ & K+ to help alleviate issues from mineral deficiency and acid-base imbalance in low salinity pond culture. It helps to improve natural food productivity and pond carrying capacity. Tower* supports complete formation of shell during molting.